Hiya guys! I know it's been a few days since I've posted and to be honest it's been just me. I often get stuck in a hole of depression and self loathing, it's hard to surface but I always eventually do. Sometimes all you need is a little time to find yourself again and that's okay. I'm sorry for the little tangent there, you're here for the polish goodies after all. Today I'm sharing swatches for the Contrary Polish's August contribution to the Polish Pickup Collaboration. If you're not familiar with the concept, the Polish Pickup offers a fun, interactive experience that allows you to submit theme ideas, vote for your favorite theme, and selectively purchase your favorite polishes every month. This month the theme is.... Old Hollywood. It's definitely an interesting theme and very board, which really brings forth the creativity in the creators. Now let's get to the swatches! Just Whistle by Contrary Polish will be available for purchase through the Polish Pickup Shop August 4th through August 7th. This full-size shade will retail for $11.50 each. 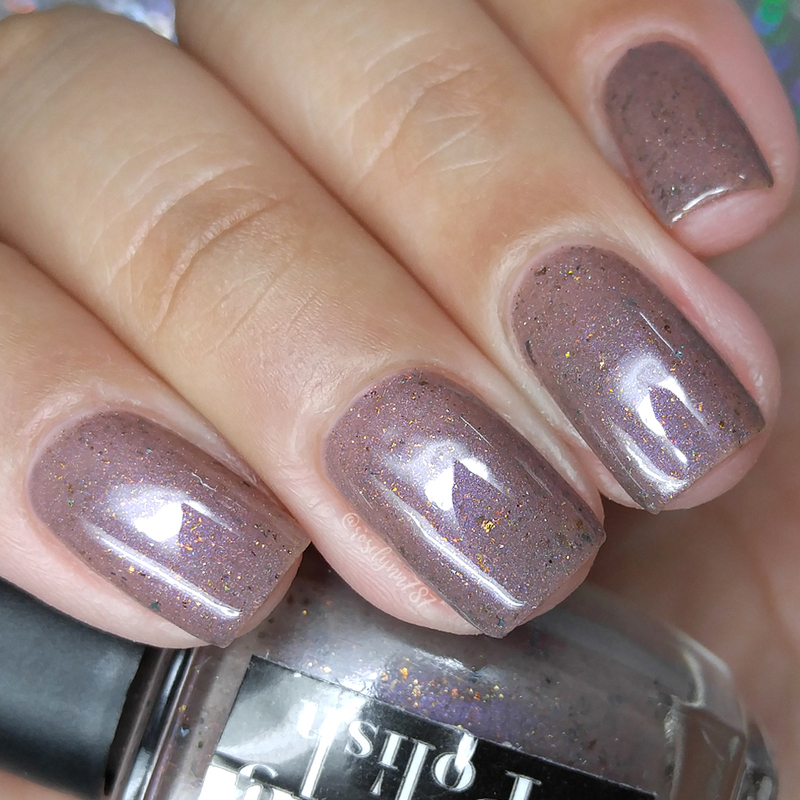 Just Whistle can be described as a slightly greyed taupe base with bronze flakes and micro-glitter, strong purple shimmer, and a bit of linear holo shimmer to add some extra sparkle. Now before we say anything more, we need to talk about those bronze flakies. Holy moly do they make this shade come to life! They are absolutely perfection in giving this polish that same come hither feel. The formula has a sheer initial application, but has a really nice and even build-up. Consistency wise it leans a little on the thin side, but it's perfect for distributing the flakies across the nail. It dries down very minimally gritty and smooths out after topcoat. Shown here is two to three coats sealed with a glossy topcoat. To recap, Just Whistle by Contrary Polish will be available for purchase through the Polish Pickup Shop August 4th through August 7th. This full-size shade will retail for $11.50 each. Be sure to join the Facebook group Polish Pickup Pack for more details and also check out the other makers involved for the month of August!